Hi everyone and welcome to my initial review on Finish Line Network, this is a new MLM company that was launched in the fall of 2018. I first got wind of Finish Line Network when I received an email from a marketer who I never imagined to be in the MLM industry. So, his email intrigued me, although there was a little too much hype for my liking, I decided to sign up for a free membership and check it out myself. Just before I reveal my thoughts on this new MLM business opportunity, I want to be fully transparent, I am not fond of companies that follow the MLM business model. In my opinion, I think the people who operate in the MLM business opportunity niche know this and this why they have pre-launch events. They get all the top leaders in the MLM industry to start promoting for them and so they are positioned to benefit the most. They even admit this in the promotional materials, but they never say that the people who will join later on will most likely fail and lose money. From what I can gather, there a few founders of this new MLM business opportunity, although there is absolutely nothing on the actual site about the people behind this launch. Greg Chambers and Doug Wellens are also behind another MLM business opportunity called Traffic Authority, that program had a number of products that are pretty expensive. However, reviews for it were not very positive and the traffic they sold was not of the highest quality. So, What Is The Finish Line Network? To be honest with you, there is so little information about the actual products, because the company is still in pre-launch phase, all the material on the site is geared towards promoting the opportunity and not the actual product. Here is what I do know from my initial observations. When you sign up, you will be presented with a promotional video by a person named Paul Counts, my research leads me to believe he is a very successful internet marketer in the JVZOO affiliate marketing scene. Although the company is called Finish Line Network, the actual site you sign up with is called ‘lockinyourprofits.com’ (with a name like that, red flags are already going up). Inside the member’s area, there are a variety of videos you are advised to watch, most of them are about how to promote the company. There is one, that touches upon the products but most of it is promotional in nature and information about the product is vague. Despite the hype that surrounds this in the video, it is just a lead generation tool, developed with the help from the team behind Online Sales Pro. With this tool, you can create mobile-friendly landing pages and collect leads, it’s like any other simply landing page builders, except, a lot more expensive. I use Landing Page monkey to build high converting landing pages and that only costs $37 per year. So, despite being the cheapest product, the only reason anyone will pay $47 pm for a simple lead generation tool is the business opportunity that comes with it. Look at the jump from $47 pm to $130 pm, a ridiculous amount of money for a product that has been designed to teach traffic generation techniques. I kept watching the description for this product just in case I missed something that might in some way justify the high price. It contains training on traffic generation techniques from the major social networks and there is also a monthly virtual live event that you will have access to. If any affiliate of Finish Line Network was honest, they would tell you the only reason they will be promoting this is only because of the high affiliate commissions (I’ll get to the compensation plan later). There is no reason to pay $130 pm for information you can access for free on YouTube and Internet forums like Black Hat World, Best Black Hat Forum, Digital Point and even the Warrior Forum. I can’t believe this is an actual product but the MLM industry never ceases to amaze me, so Finish Line Network (FLN) will be holding regular live events which will cost you a cool $997 to attend. These events will be held over two days with the first set to take place around January 2019. There are rumours that network marketing giant, Ray Higdon, is set to be the star speaker at that event. Despite what they say, the only reason they hold these events is to make people feel good and tell them a load of hogwash that the money they have spent will soon return a positive ROI. You’ll most likely hear from the top earners telling you how FNL has changed their lives but in reality, most of these top earners have made their money from multiple MLM business opportunities. The sole reason for these events is more money for the owners and top leaders. So, I watched this section a few times, making sure that what they were charging nearly 2k for is essentially an email marketing course. I really shouldn’t be surprised but I am, there is no justifiable reason to charge a ridiculous amount of money for something that nearly every autoresponder service provides for free. To justify the price they used words and phrases that didn’t make much sense, it was more like a word salad. The course will provide you with 8 hours of live intensive training at the end of which you will be certified (in what?? Who knows!!). There is also something called a click buyback program, they didn’t really explain what it was, and you will be taught advanced email marketing monetisation strategies. If I sound cynical, it’s on purpose, the amount of hype in each video is nauseating when it becomes all about the money and the products are just an afterthought, you know the products will be at best average and not worth the price tag. I wish they had a simple compensation plan but that would make life so much easier and MLM companies are not in the business of making life better or easier. I’ll explain the basic comp plan but if you want a challenge, become a free member, watch the videos and try working out their full compensation plan. They call their comp plan ‘The Profit Maximizer’ and it has been developed to maximize profits for all paying members. Like all MLM companies, it is a pay to play system, to become an active affiliate for FLN, you will need to pay $20 pm for the opportunity or you have to purchase the product you want to promote. There are two types of commissions in the FLN comp plan, direct commissions which are paid weekly and the bonus pool commissions which will be paid monthly. Direct commissions will be split 50/50 between you and your sponsor, this can rise to 80/20 split if you manage to sell more than 6 of any one product. So, for example, if you manage to sell 7 silver packages, you will earn 80% commission. Like all MLM companies, they have a ranking system that will determine your commissions and your bonus pool share. 20% of every sale is put into the monthly bonus pool and at the end of every month, affiliates are paid a commission based on how many shares they have earned. Shares are earned through the selling FNL products, how many shares you receive depends on what products you sell. To be frank with you, this is a confusing part of the comp plan, I can’t really explain how it works but if you really want to know, just become a free member and watch the video. So, I have seen a couple MLM pre-launches that talked a big game but produced very little in the way of online education. Yes, people did make a lot of money, but these are people who have massive email lists and have been in multiple other MLM schemes, many of these MLM companies are no longer in operation. If you break it all down, what FNL will be teaching you is how to make money through email marketing that is why the main type of advertisement they promote is solo ads. The products are not worth the price they will be charging and are only there to recruit others. You may hate this review and want to believe all the hype they are feeding you, believe me I know the feeling. I was with a couple MLM companies and I hated reviews that told me they were dodgy or scams, why? Because I wanted to believe them when they told me that making money online is easy. Finish Line Network is no different, beyond all the hype, there is very little they offer. If you are looking for a legitimate way to start making money online, check out my no.1 recommendation, they have been helping people start an online business for over 13 years and are continuously updating and improving their platform. Thanks for commenting, yeah a lot of people have lost money with MLM companies, I really wish they were regulated a bit more. And prices they charge are ridiculous. One of the many reasons I never promote companies the follow the MLM business model. That is the sad thing about these types of business, a lot of noise but no show and it seems that the ones who really gain are the ones at the very top of the pyramid which is not much. I have been a part of a few of these so call make your dream come true programs and have seen very little. It is good that you are sounding the alarm and opening the eyes of so many people so they won’t fall into these kinds of trap. Thanks for your comment, I like your description ‘lots of noise but no show’, I think a lot of people who look for legitimate ways to make money online, will fall prey to these schemes. They make it sound so easy, but as well know, making money online is not that simple and people should be told the truth before they part with their hard earned cash. thanks so much for sharing your review, I have not heard about Finish line network before but then, there are so many programs online. Having said that, it`s no surprise that I have not heard of the program, for the price they charge, it`s well out of my reach.$47 a month for a landing page something that can be found free online is not something many are willing to pay. $1997 for an email marketing course,well it sounds like they only sell their products to the already very successful marketers.MLM companies, in my opinion, are good for already very experienced marketers who can aggressively market and also teach their downlines how to do the same. Now you mention drop shipping as a good alternative to start making money online without a huge investment.Now something I have never thought of is drop shipping, what do you think one will have to invest (moneywise) to start drop shipping? Thanks for your comment, yup the products are way over priced and that is one of the hallmarks of a MLM company, pricing products/services above market value. Also true that only experienced marketers with massive email lists will be successful with the opportunity, the rest will lose money. As for dropshipping, you can get started for less than $100, however, in this article, I actually how how to start a dropshipping business for free. Thank you so much for the honest review! When choosing a MLM company to go with it is very important that the people who start the business are credible, have a physical product that is worth what is being sold for and not just a copy cat product, which sounds like what they got! It is also important to go in with the right mindset and not thinking you are going to be making the big bucks instantly cause you arent going to. I think another reason people fail at mlm is because in network marketing you need to know how to cold contact. Unfortunately most mlm companies dont have the resources to do so! Are there any mlm companies that are legit that you know of? Thanks for the informative article. Definitely not going to be paying them any money any time soon. MLM programs always seem to be popping up every month. It’s surprising people have yet to learn about the realities of MLM programs. Will be checking out those Droppshiping/Affiliate Marketing buttons very, very soon! I’m very disappointed, but not surprised that this new MLM opportunity is probably not going to work either. I’ve tried, I really have, and that’s why I turned to the Affiliate Marketing strategy instead. I have devoted countless hours working on various MLM opportunities, and they always sound so good, don’t they? It seems “so easy” to make a killing, except then it isn’t lol. Thanks for doing the heavy lifting on this one and saving me the aggravation. I appreciate it so much. A company that sells subscriptions to join in order to sell a product they barely mention? You would think that after years…no…decades of these kinds of operations, that posts like yours would no longer be necessary. Sadly, they seem more vital than ever before. I say sadly, because there are still too many people out there who are easy prey for “opportunities” like the one you unmask. I was involved with an MLM company about 20 years ago, and while they had a very good product range that actually worked, over time, I realized that A. They were part of the exception, and B. MLM is one extremely tough business. Now, take out the “good product” part, and you have, just a shell. That’s what you’re revealing in your article. Thanks a lot for sharing – and keep up the efforts. You are doing a lot of people a tremendous service. Thanks for this thorough review, I cant believe the money they charge for some of these products. So many internet scams, its difficult to know who to believe, I will stay clear of this company, did you lose any money with them? Thanks for the recommendations, I will check them out. Holly cow they want 1997 for an email marketing course that absolutely ridiculous. There are many programs that will teach you email marketing and charge two arms and two legs. I’m an affiliate marketer and I must say that I will steer clear of things like this. Thank you for your review on “Finish Line Network,” I will definitely avoid it. Thanks again. 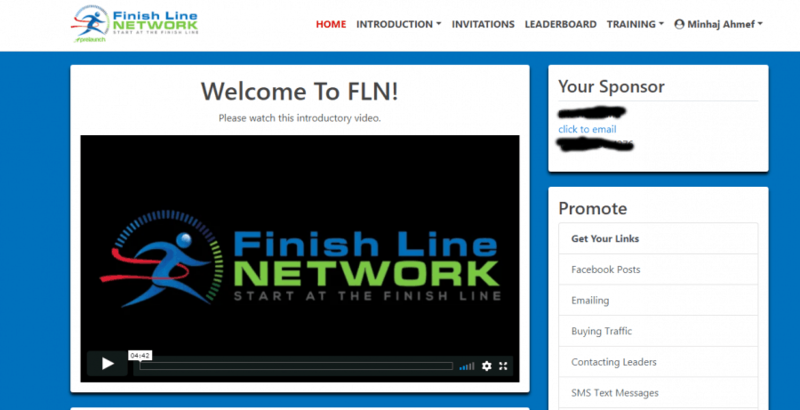 Thanks a lot for the comprehensive review post on Finish Line Network. I joined a few MLM programs and to be honest with you nothing went right. Few companies are closed and few companies cases are in the court. I lost my money and my efforts went on vain. I do agree there are some genuine companies but most of them are scams or those who under delivers what they promise. I personally don’t prefer MLM because of the bad experience I got. I referred many of my friends and family members to those MLM companies and when things went wrong I can bear my personal loss but those people who we joined are joining in trusting us or for our face value when they lose money it hurts a lot. After reading your review post for me Finish Line Network is “Thumbs Down” Thanks a lot for saving people time and money. Thanks for your comment, I too was with a couple of MLM companies and had some bad experiences, its why I warn people to never join these schemes. The only people making money are those at the top. Thank you, I have come across this website, while looking for something else. It makes me feel sick just reading about these gross amounts of money that members are encouraged to pay and yes for what!? Silver, gold, black levels too, was one I was caught up in. At the end of the day I felt such a fool and totally scammed. The one I joined insisted that no way were they MLM! But to my mind they certainly were! I believe they should be better regulated, are they these days? I’m with you, I sometimes cannot believe the marketing tactics they operate under, they are so deceptiive in their advertising and unfortunately, the industry isn’t regulated that well. However, with the recent shut downs of similar companies, things may be changing but we will have to wait and see if those shut downs were just a one-off or if the authorities are really starting to crack down on these schemes.